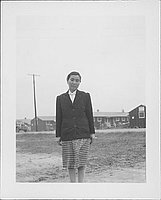 Three-quarter portrait of a woman in dark jacket over white blouse with bow at collar and a plaid skirt standing with arms at sides in an open area in front of barracks at Rohwer concentration camp, Rohwer, Arknsas, 1942-1945. Her hair is pulled back. 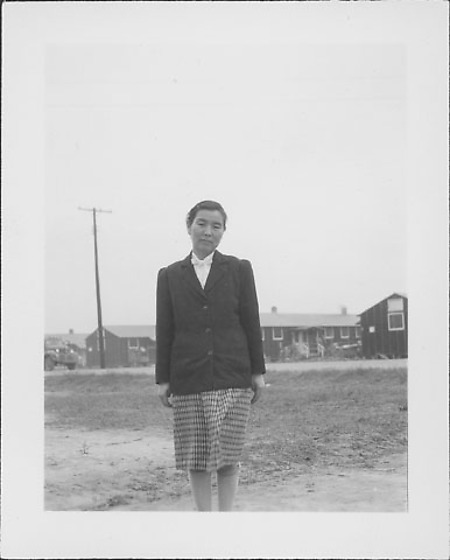 Something, possibly a handkerchief, is tucked into the top of her left sock. A truck is parked near a telephone pole at CL.